Carpet beetle larvae are extremely common household pests. As adult beetles they are harmless, but during their larval stage they can be quite destructive. The larvae are tiny, brown, segmented, and covered in minuscule bristle-like hairs…so a perfect match for the creature in the picture! 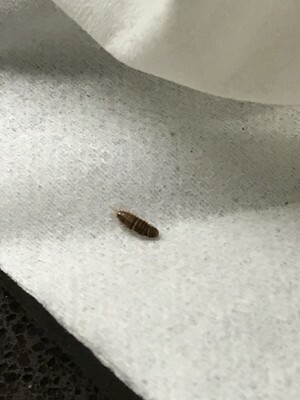 Since our reader has found carpet beetle larvae in two different areas in her home (the laundry room and bedroom), it is crucial that she gets to work immediately to prevent them from spreading to other areas and to get rid of them ASAP. Getting rid of carpet beetle larvae really just depends on one thing: cleaning! She will need to clean in order to eliminate larvae, eggs, and potential food sources. 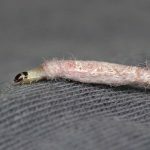 Carpet beetle larvae primarily eat carpet, bedding, animal products, clothing, and other fabrics, but they will resort to eating just about anything if necessary (including dust, pet food, and other small particles.) 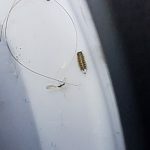 Their willingness to scrounge for food paired with their habit of sneaking to different areas looking for something to eat is what makes these larvae such annoying household guests. 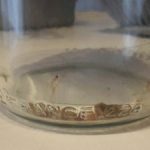 We think these larvae might primarily be camped out in our reader’s bedroom and just ended up in her laundry room by means of her dirty clothes hamper. So, we think she should start looking for them in her room. 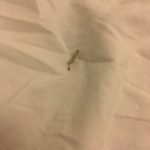 Common places that carpet beetle larvae enjoy are beds since they can eat so many items of a bedding set, and closets because of the clothes. She should remove all of her bedding and the clothing from her closet and dresser, looking for signs of carpet beetle larvae. We recommend she wash everything and get rid of anything that has been damaged. 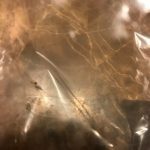 The most important thing is that she remove the primary food source from her home immediately since it is likely crawling with larvae and eggs. This primary food source might be her mattress, her wool sweater, a feather pillow, or something else, but whatever it is it has to go! Once that has been taken care of, she should start a daily cleaning regime of doing laundry, vacuuming, dusting, and sweeping. She should keep this regime up for at least 2 weeks, but more preferably 4 weeks or until there are no more signs of larvae in her home. She should definitely clean her bedroom, closet, and laundry room, but it might be worth it to clean her entire house to be on the safe side! We hope our reader is able to get rid of the carpet beetle larvae in her home before she is dealing with an infestation. As we mentioned, she should start cleaning to eliminate these creatures ASAP. The silver lining? 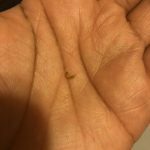 While these larvae can destroy household items, they aren’t considered dangerous to human health! We hope our reader is able to get rid of the carpet beetle larvae in her home before she is dealing with an infestation. As we mentioned, she should start cleaning to eliminate these creatures ASAP. The silver lining? 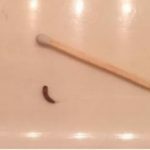 While these larvae can destroy household items, they aren't considered dangerous to human health! 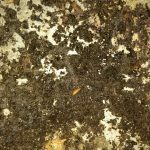 Could Worms In Chinchilla’s Bowl Be Carpet Beetle Larvae?